my bare cupboard: Pistachio lemon cake "
It's one of those days again when I'm just too lazy to do any baking much less take some photos . By the time I baked this cake I just have enough for only half of the recipe pffffttt ! Now I can relate when some bloggers keep griping about how there's not enough light during winter season to take a decent photos . To think it's already April in this side of the world ! You want to know about the cake ? * Preheat oven to 300°F / 150 °C . Grease a 6 x 3 x 3-inch loaf pan and line with parchment paper . Finely grind the almonds and pistachios together , set side . * Beat butter and sugar until light and fluffy . Beat in eggs , one at a time , scraping the sides of the bowl after each addition . Add lemon zest and vanilla then fold in the nuts , stir well to combine and then add in the flour , mix well . 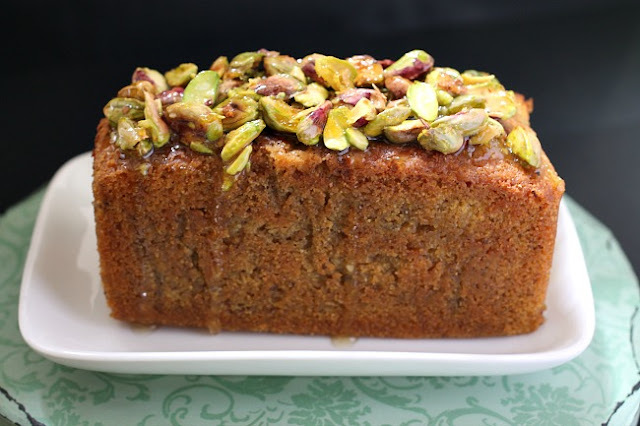 * In a small saucepan , mix sugar and lemon juice , boil until syrupy , then add in the zest ; stir in pistachio and pour over cake . *** The pan used in the original recipe is 12 x 4 1/2 x 2 3/4-inch loaf pan . Butter is 2 1/4 sticks , though the 1/4 stick is only for greasing the pan ( ugh ! ) . 1/2 cup all-purpose flour is used in the original recipe . HI Anne! So are these considered "moody" shots? 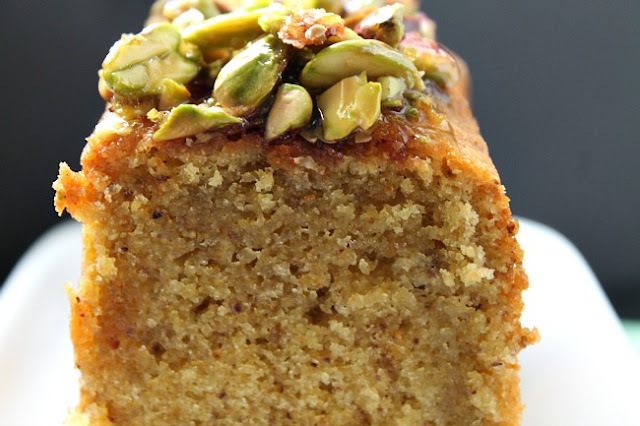 I love pistachio and sometimes have the nuts with my wine... love the lemon combination... Nice! is it small or big tiyay? sin-o nag ubos??? Your cake looks beautiful! And your photos are lovely! Feel like having a slice of your delicious looking cake! Yep it's been raining here too, just when it's time to go home! Imagine the crawl back:S Always nice to come back to a good piece of homey cake like this one:) Looks yum! Your cake and photo don't look moody at all to me. Still pretty and good. Maybe you are the only one that is moody... This beautiful cake will cheer you up! This cake looks so gorgeous. Love the gathering of nuts on top. Totally understand the frustration of not being able to take a decent picture... so annoying isn't it. Gloomy weather and your photos still come out so good. Anne, I love this cake loaded with nuts. Hi Anne, nah, these are pretty chirpy shots to me :). I once managed to take some moody shots, totally by accident. And that's right after a thunderstorm, when the lighting is almost akin to dusk...anyhow, this cake looks good and moist, lemon and pistachio sounds like a really unique combi, must try one of these days. 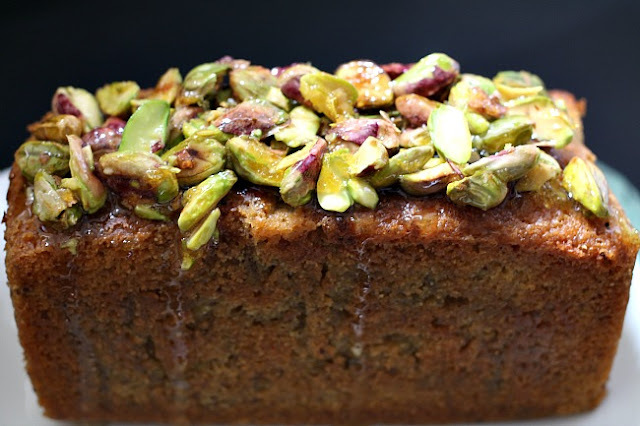 I love that pistachio topping, too tempting my dear!! The pistachio toppings make that cake so yummy in my eyes! hi anne, your 1st three sentences in your post actually relate my current status..it's been raining here every evening.. hot day, i dont feel like baking ..rainy day, i feel like sleeping? how like that? LOL! Pistachio and lemon - lovely. Have a great week. 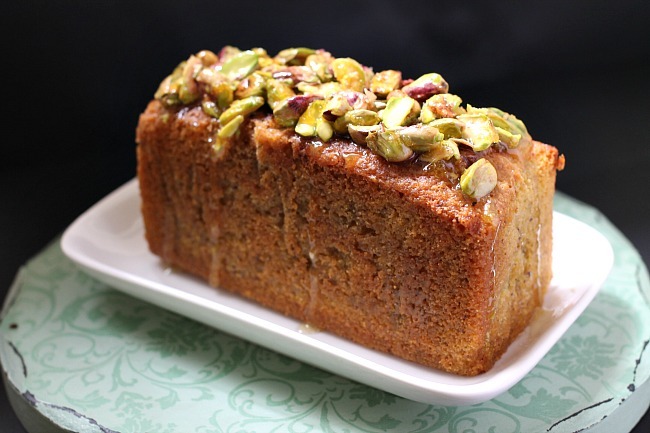 Hi Anne, very nice lemon cake with pistachio. The texture of the cake look very moist. I love anything lemon, this cake sure taste heavenly.